*I was sent a beach themed party kit from Child's Play Communications in exchange for my promotion of the movie. All opinions and wacky youth group are my own. Special thanks to our youth intern for organizing and filming the beach party movie night. Are you a "High School Musical" fan? Are you a "Grease" fan? Are you a "Beach Party" fan? Well if you are, have I got good news for you: The Disney Channel will be premiering its brand new original musical movie, "Teen Beach Movie" on July 19 at 8:00pm (ET/PT). This family friendly movie is perfect for family movie night; it's got surfing, time travelling, silly nicknames, and of course plenty of singing and dancing. 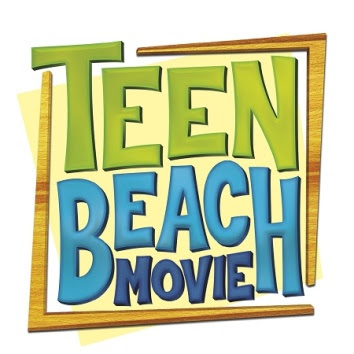 "Teen Beach Movie" melds the surf, musical, teen, and summer romance genres. Its score is written by the same fellow that did "High School Musical" so you know that the tunes will be catchy ("Getcha Head in the Game" was in my head for weeks after I first saw HSM) and it is choreographed by Christopher Scott who is one of my favorite choreographers on So You Think You Can Dance. On July 21st there will even be a sing along version of the movie on Disney Channel! That will be super fun! Disney has even made it easy for you to go all out with a "Teen Beach Movie" theme by making a downloadable party kit available full of recipes, themed games, activities, and music videos. Our youth group at church was more than happy to help with the promotion of the movie. You can see what they got up to in the video below.